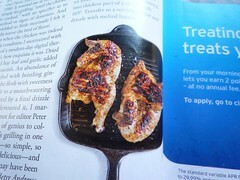 So, as expected, this summer food magazines were filled with all kinds of tempting recipes for the 2014 barbecue season. The July issue of Bon Appétit alone contained a full spread on DIY Korean barbecue; an Austin, TX spread featuring an outrageous-looking citrus-brined pork loin and a grilled rib eye recipe; a Middle Eastern/North African spread featuring mint and cumin-spiced lamb chops and Moroccan chicken brochettes; an article on cold smoking; and a guide to making and grilling your own sausages. Just that single issue was enough to keep someone busy over their barbecue for months--and, trust me, it did. But the recipe that turned out to be the single biggest revelation of the summer here at AEB--at least when it comes to the thrill of the grill--was a lonely little number accompanying a book review in the June/July 2014 edition of "Fare," the front section of Saveur. The book in question was a compendium of more than a century's worth of writing on grilling and grilled foods culled from the pages of The New York Times by Peter Kaminsky. The Times has been on fire* with their food journalism of late, with a bolder, multimedia-savvy approach that's smart, informative, au courant, and well-designed, and this tome sounds like another play to further establish position within the lucrative food & wine media market. It's called The Essential New York Times Grilling Cookbook, and it's as much of a legacy-builder as it is a collection of hits from the Times' recent generation of superstar food writers--it's clearly meant to prove that the Times has been writing about food with insight and passion all along, decades before the advent of modern-day foodie-ism. Anyway, Betsy Andrews' review only features one recipe, but it was one that definitely caught my attention. 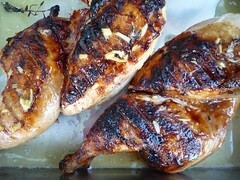 The recipe was for poulet grillé au gingembre--grilled chicken with ginger--it was co-authored by those old masters of the Times' '60s, '70s, and '80s heyday, Craig Claiborne and Pierre Franey, and it first appeared in the May 25, 1980 edition. Andrews was effusive in her praise, but what really caught my eye was that French connection to ginger. Though it's had a presence in European cuisine since at least the days of the Roman Empire, ginger is a rarity in French cuisine. Waverley Root, in spite of his name,** is utterly silent on the subject in his magisterial The Food of France. Ginger is entirely absent from Richard Olney's Simple French Food and his The French Menu Cookbook. And the rhizome appears only once in Julia Child's two-volume Mastering the Art of French Cooking, and then only in a beef recipe that already contains gingerbread as an ingredient. The only place I'd actually ever noticed ginger in a French cookbook before was in yet another Richard Olney book: A Provençal Table: The Exuberant Food and Wine from the Domaine Tempier Vineyard, a.k.a, Lulu's Provençal Table. There, Olney doesn't make a fuss about it at all, but the recipe in question always intrigued me because it just seemed so unlikely: "Poulet Rôti au Gingembre, Coudes au Jus" (Roast Chicken with Ginger, Macaroni with Roasting Juices). "Macaroni & chicken?" I'd never ever tried it, but it has been near the top of my "to make" list for a long time. When I spied Claiborne and Franey's recipe my decision was made: there was no doubt about it, I was finally going to test this Provençal chicken & ginger combo. I still wasn't sure about its origins (North African? North African by way of Italy? Was Lulu's preparation some kind of clue? ), but its apparition in Andrews' book review was clearly a sign. Plus, the recipe is dead simple. Mysteriously so. As Andrews puts it, "It worried me at first: It called simply for grilling 'until the chicken is cooked,' with no specifics as to method or signs of doneness. And it yielded so little marinade I felt it might starve the bird of flavor." But, according to her, the results were a classic example of one of those recipes that defies logic, one of those recipes whose process is almost alchemical: "[When] the chicken was indeed done (a condition I ascertained with the use of a modern-day digital thermometer), how exquisite it was. Dried thyme and bay leaf and garlic added aromatic flourish. An abundance of lemon mingled with bristling ginger to stroke the flesh with sweetness and tenderize it to a mouthwatering moistness, abetted by a final drizzle of butter" (!). And you know what? I couldn't have agreed more. I, too, had the feeling that the recipe couldn't possibly work as I prepared it. And I, too, experienced something magical instead when I cooked the chicken. The final product looked great, but it tasted a hundred times better--it had a perfect skin, and was literally bursting with flavour. The ginger was subtle, but present. And that final blast of butter... I couldn't believe what I was tasting, and neither could Michelle. Season the chicken generously with salt and pepper. Stir lemon juice, oil, thyme, bay leaf, garlic, and ginger in a bowl. Add chicken and toss to coat. Cover with plastic wrap and chill for 2-4 hours. Heat a charcoal grill, making sure that your charcoals are evenly spread and of an even height. Ideally, you want a fire that's medium-hot. Be patient. Grill a bunch of vegetables first, if you have to. Grill chicken, turning as needed, until slightly charred and cooked through, about 35 minutes, or until an instant-read thermometer inserted into the thickest part of a thigh reads 165º F. Transfer to a serving platter and drizzle with melted butter. Tent the chicken with aluminum foil and allow to rest for 10 minutes. This will complete the cooking process and allow the chicken to release its delicious juices into your platter. Serve and devour. Serves 2 to 4 people, depending on appetite and number of side dishes. I still haven't tried Lulu's chicken, ginger, and elbow macaroni recipe yet, but I will. Believe me, I will. And I haven't fully figured out that French connection to ginger yet, but I like it--I really, really like it. In fact, there have been times recently when I've declared it the very best grilled chicken I've ever tasted.